So Barnabas Collins is dead — not dead like he’s given up on his dream of becoming an Olympic speed skater, but dead like he was already pretty much dead anyway, and then a crazy woman entered the cave where he was sleeping, and hammered a stake through his heart. You know, dead. And here’s the odious Tim Shaw, who’s dropped by Count Petofi’s secret underground lair, bringing the news to the mad god of the forest. 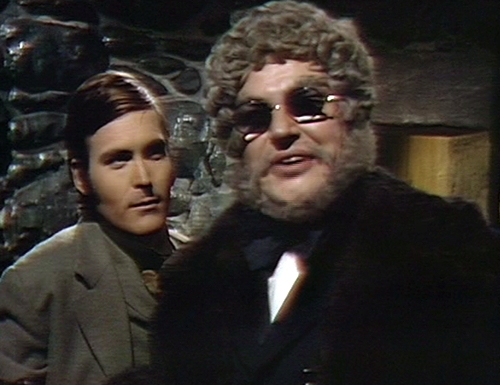 Tim is under the impression that if he goes to people’s houses and tells them that Barnabas is dead, then they’ll say, thank you very much for the information, here is an enormous wodge of cash. This is not a scalable business model. Tim needs to get a life of his own. But that’s what we’re doing today, your standard information management episode. Information management is the bread and butter of long-running serialized narrative — something happens, and then you spend a couple days telling everybody in the cast about it. If you play your cards right, you only have to do one actual incident, and then everybody spends the next two weeks processing their feelings about it. This is how Once Upon a Time works. Introduction. Tim talks to Petofi. Round 1. Petofi talks to Julia. Round 2. Petofi talks to Quentin. Round 3. Julia talks to Quentin. Epilogue. Commedia dell’arte hallucination sequence. This structure is standard theatrical practice. Let’s see how it works. Round 1: Petofi talks to Julia. Barnabas is survived by his friend, Dr. Julia Hoffman, whose astral body traveled to 1897 while her physical body sits around in the basement, gathering dust and cobwebs. Having an astral body is a lot like having a regular body, except you can survive gunshots, plus you can eat anything you want and not gain weight. You can also live rent-free in a cluttered studio apartment in the old rectory district. Astral bodies are super convenient; I wish I had one. Count Petofi comes over to the rectory for a social call, because he knows this is where she’s hiding. Everyone on this show has a secret headquarters that everybody else knows about. Now, the last time Petofi saw Julia, he was turning her over to his psychotic henchman, who was supposed to kill her. So when he strolls in the door, he says, “You needn’t be alarmed, Dr. Hoffman. I have no intention of harming you.” She asks what he wants, and he announces, “First, to congratulate you. Thanks to the bravery of Barnabas Collins and the incompetence of my man Aristede, you are still alive.” This is small talk for Count Petofi. Then the Count drops his bombshell on Julia — Barnabas Collins is dead — and she responds in typical Julia fashion, putting her hands up near her face and then running through a complex series of facial expressions. Then she gets ahold of herself and turns toward the camera, because tragedy is no reason to miss an opportunity for a close-up. “Did you kill him,” she growls, “or did you have him killed?” This is the kind of question that Dark Shadows characters ask each other all the time. And this isn’t bluster; she actually wants to know the answer. Petofi smiles. “My hands are clean, Doctor. He fell victim to the wroth of an outraged woman. Charity Trask drove a stake through his heart. Her motive was revenge; apparently, Barnabas Collins had caused the death of her fiancee.” Yeah, that sounds like Barnabas, all right. This scene is more like a combination between a Mafia shakedown and a hostage negotiation. Any conversation that begins with “congratulations on surviving my last murder attempt” is not going to end with a hug. Petofi informs Julia that he knows she’ll be going back to 1969 soon, and he plans to go with her. “You will be under surveillance morning, noon and night,” he says. Then he leaves. Apparently, the community watch program hasn’t kicked in yet. Round 2: Petofi talks to Quentin. Things are a little different with Petofi’s next threatening house call, because Quentin always offers a beverage. Quentin says, “Break it,” and hands Petofi a glass of brandy. “I see,” Petofi chuckles. “I do admire a man with the courage to live as dangerously as you do, Quentin. I would give almost anything to witness the fury you’re about to unleash.” Again, the mad Count has his own style of introductory remarks. 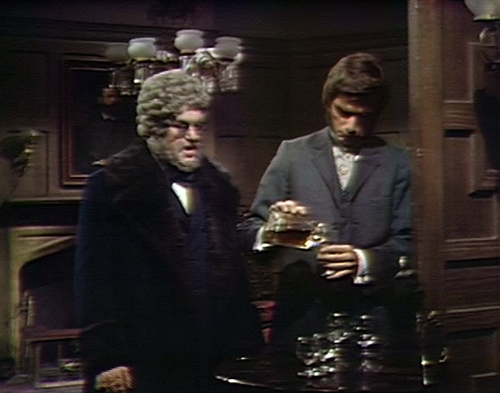 But then they get down to business, and Petofi drops the news that Barnabas is dead. This is in the form of another “Congratulations!” speech, which is Petofi’s trademark. “You disposed of Barnabas Collins!” says the Hallmark card, and then inside: “Having Charity Trask drive a stake through his heart was a stroke of genius!” Then there’s some space underneath for everybody in the office to sign. Quentin’s reaction is typically self-centered: I didn’t do it, I went there to kill him but I failed, I wasn’t responsible for his death. The whole cycle takes about thirty-five seconds to complete. 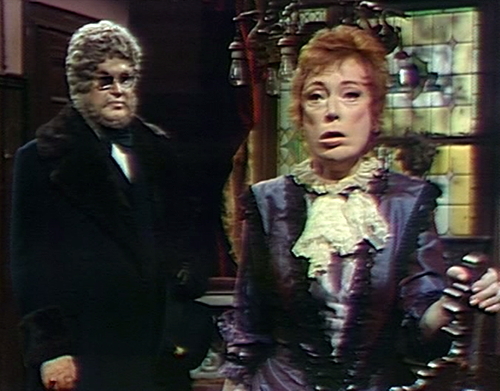 That’s the other thing that sets Dark Shadows apart from normal soap operas — the pace of these scenes. On a regular soap, this conversation would spread out over at least two episodes. 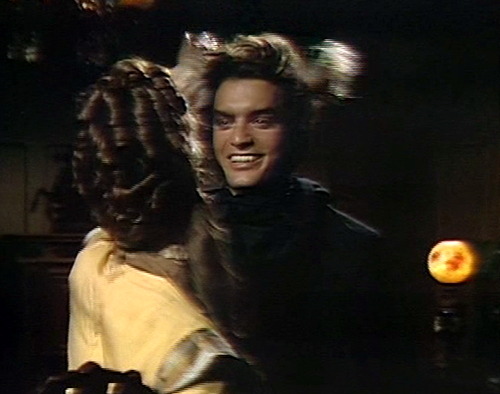 On Dark Shadows, they sprint through the emotional content, so they can set up the next time-travel murder scheme. Quentin’s on the hook to Petofi for his werewolf cure, so the boss gives him instructions. “I want you to watch Julia Hoffman day and night,” Petofi says. “You are to report every move she makes to me.” Then he toddles off, leaving the defeated Quentin standing at the window. It’s not clear when the surveillance is supposed to take place — “morning, noon and night”, Petofi said, so maybe that gives them the afternoons off. Round 3: Julia talks to Quentin. So Julia makes it easy on everyone; she just goes directly to Quentin, so he can watch her morning, noon and night from the comfort of his own home. This is actually quite a sweet scene, considering they’re both keeping terrible secrets from each other. 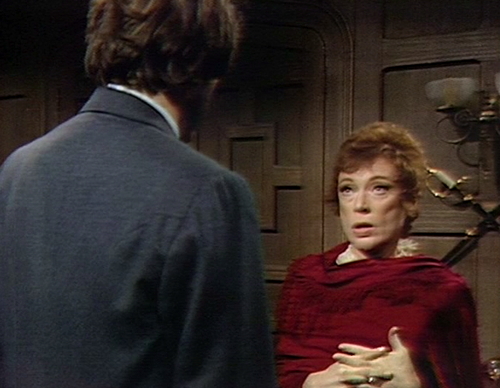 She says that Barnabas wanted Quentin to leave Collinsport, because it’s too dangerous for him here, and Quentin suggests Julia should leave 1897, and go back to her own time. Everybody’s an undercover travel agent today. 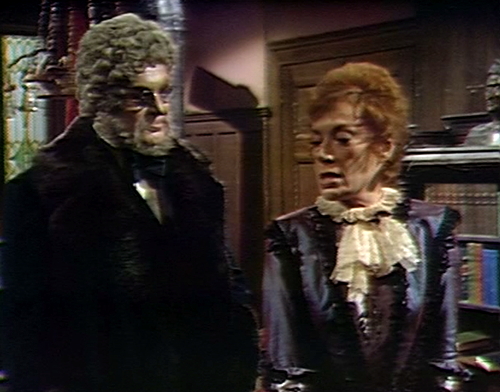 The strange thing is that they’re both acting like the story is over, now that Barnabas is dead. It’s like they’re graduating from college, and they’re talking about what’s next — Quentin is going to travel, and Julia’s going back home, and then they’ll figure out what to do with the rest of their lives. It’s funny how much this still feels like Barnabas’ story, considering he’s spent the last few months hiding in a cave and not doing very much. There was a similar moment last summer, when the Dream Curse ended, and it looked like Barnabas had been killed. Willie and Julia dragged his body out into the woods and buried it, and then they stood around and talked about where they were going to go, now that this chapter of their life was over. It’s a strange moment for a soap opera, the feeling that they’re drifting towards a conclusion, which is antithetical to the medium. There should never be an ending on a soap, at least not unless it overlaps with other stories that are just beginning. And it shouldn’t feel like a conclusion anyway, because there are still lots of loose ends, with Count Petofi’s machinations as the obvious ongoing menace. But losing Barnabas makes the show feel unmoored. There are four core characters on Dark Shadows — Barnabas, Julia, Angelique and Quentin — and Barnabas is the center of that group. The other three are connected to Barnabas, much more than they’re connected to each other. So with Barnabas gone, the others are drifting apart. Quentin is going to run off with his girlfriend, leaving Angelique behind. Julia will go back to 1969. And if that happens, then there’s no reason to think that they’ll ever meet up again. The core characters just disperse, and entropy takes over. 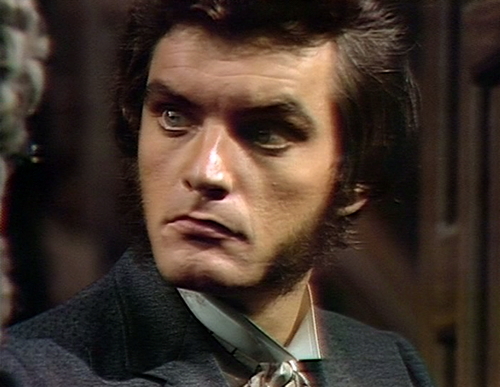 Losing Barnabas is an existential threat to Dark Shadows. That’s not a normal situation for a soap opera, but this is not a normal show. Epilogue: Commedia dell’arte hallucination sequence. At the end of the episode, Count Petofi returns to the beginning — with Tim Shaw, at the mill. Tim’s still waiting around hoping for a tip, and instead he gets a free session with the I Ching, a Chinese divination technique that does whatever it feels like. Tim casts the I Ching wands, and they’re arranged into a hexagram — but it’s not one of the hexagrams that we know, and they don’t announce which one it is, which is annoying. I mean, how are we supposed to follow this story, if they won’t even tell us which hexagram they’re using? Tim meditates over the wands, and soon he’s transported into a dream world, where he sees a villain with a mask and hood, menacing Amanda. 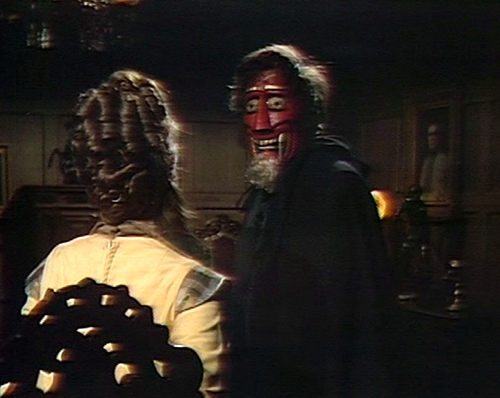 The young woman rips the mask from the villain’s face, and reveals that the attacker is Quentin, who strangles her to death. Of course, in I Ching visions, as in life, death doesn’t necessarily mean death — it’s just a transition from one state to another, the end of one cycle and the beginning of another. So Quentin isn’t necessarily going to kill Amanda. Maybe he’s going to propose to her, or help her pay off her student loans. Still, if I was her, I wouldn’t make any long-term plans. In the teaser, Beth tells Tim, “I get the feeling that you feel he’ll be more than grateful. Am I wrong?” I don’t know if that’s a blooper or not, but it doesn’t make any sense. When Petofi enters the mill in the teaser, a boom mic ducks into view for a second. Quentin asks Amanda that he loves her, and she objects, “Tim, you don’t know enough about me.” During his next line, she realizes that she’s called him by the wrong name, and she pauses, smiling. “Quentin…” she says, and it takes her a second to remember where she is. He grins too, and then they get back on track. Someone coughs in the studio when Quentin tells Petofi, “I don’t imagine she’ll be very happy,” and then again during Petofi’s next line. When Petofi approaches Quentin at the drawing room window, the camera shoots too high, and catches part of the studio light. I take it back about Tim Shaw’s hair being sponsored by Vitalis. It must have been Brylcreem — and not just a little dab, but most likely half a tube. Either that or Briscoe fell head first into a bucket of lard prior to taping. Tim Shaw’s hair was never that flat and greasy months ago. It definitely seems like a statement as to how unseemly the character has become — ever since having been “touched” by the Hand of Count Petofi. That’s what the Hand does — it gives you the greasies. Tim better thank the Hand for just giving him the greasies and not the signature Count Petofi Toni home perm. So, Barnabas is the Carrie Bradshaw of Dark Shadows while Julia, Angelique and Quentin are Samantha, Miranda and Charlotte. Okay, I’ll bite (no pun intended). Barnabas = Carrie, the lynchpin of the group. Quentin = Samantha, wild and free. Julia = Miranda, career first. Angelique = Charlotte, pining for that one true love. I guess Josette is Mr. Big. Josette went off and married Jeremiah like Mr. Big went off and married Natasha, so it could be. 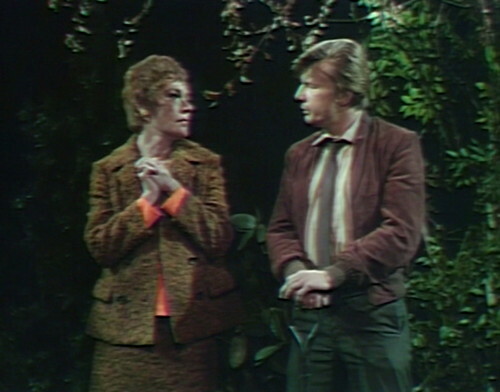 Just before Petofi stops in to visit Julia at the rectory, as the scene begins we see a close-up of Julia handling a loaded syringe, which she then places in her medical bag and which should have been a tip-off to viewers at the time that Barnabas may not actually have been killed. There was only one thing Julia was using the syringe for during her sojourn to 1897. As in 1968 with the conclusion of the Dream Curse, they won’t let more than one episode or so go by before they start dropping clues. In the prologue, Tim Shaw tells Beth Wait and see, with more than a hint of W C Fields. Just when you thought he couldn’t be more annoying. Tim did another overt W. C. Fields impression in an earlier episode (with Amanda, I believe). It takes a lot to icky-yuckify a guy that looks as handsome as Don Briscoe; kudos to DS for making Tim Shaw so oily (figuratively AND literally). Maybe a Petofi Home Perm would look good on him – anybody out there that’s good with Photoshop?